The volume of data managed by organizations today is growing exponentially as a result of increased dependence on digital content and long-term data retention. While businesses can become more agile via the use of information technology, there's a price to pay: conducting business requires uninterrupted access to data and systems. IBM delivers a portfolio of data protection and retention solutions that can improve efficiency in many ways. 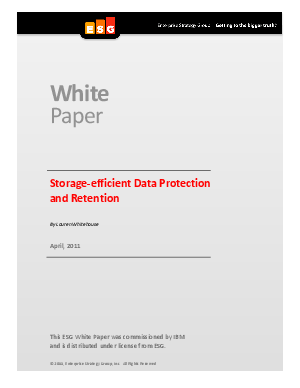 This ESG whitepaper will review the challenges introduced by data growth and focus on IBM data protection and retention products/technologies that address storage efficiency.